My Orange Brompton: Finally a new pair of SPD shoes! My current SPD shoes as regular readers will know have truly given up the ghost. They have served me well but all seems to have stretched to a point the straps have to be pulled pretty tight to keep the shoe from moving around. 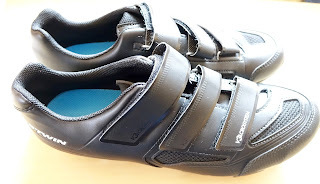 I had bought a pair of Shimano M089's but one of the straps broke so I returned them for a refund. Finally I bought a pair of 'B'twin 500 Mountain Bike Shoes' annd not only did I save some money they are more comfortable. 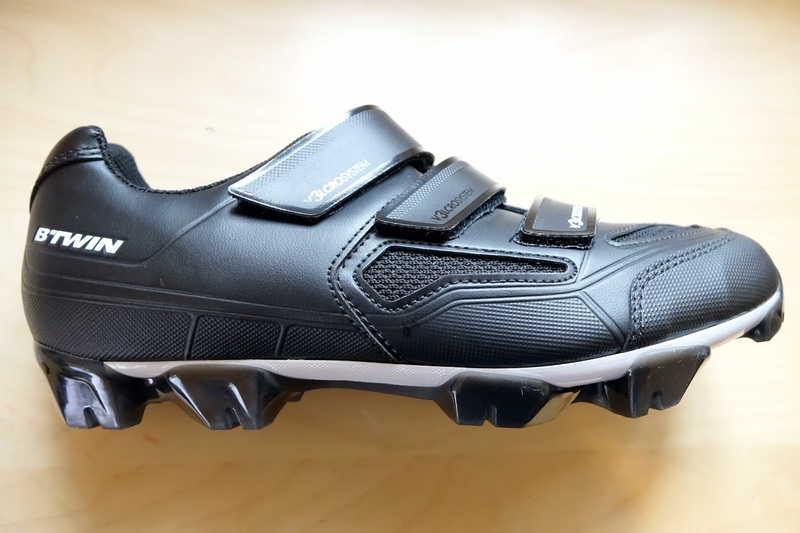 The 'B'twin 500 Mountain Bike Shoes' are a pretty standard pair of mountain bike SPD shoes that allow the user to walk quite happily and are compatible with SPD type cleats. I used to have a pair of DHB which although not expensive were really comfortable and these remind me of them. 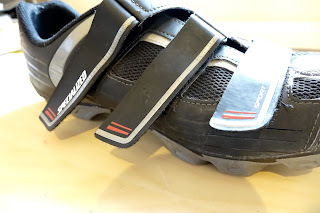 Three strap closure are positioned better than my old Specialized shoes and offer a very good and secure fit. The heel is high and the cut out makes things comfortable on the ankle. Being padded only adds to this. The insole is padded and provides a good about of support. The arch of the foot is well supported and the lightly padded tongue keeps the foot firmly in place. The sole has a very good grip and there is even a place at the toe for additional studs to be fitted if they are perhaps being used for mountain bike rides. In terms of rigidity the nylon sole is quite stiff and provides a firm platform for pedalling. If you have a look at the photo below of my old shoes you can see that the straps come down a long way. The upper is designed in the different way to that of the 'B'twin 500 Mountain Bike Shoes' but they have become unusable. I do not have a particular narrow foot and as I have suggested I can only put forward the notion that over the time I have have them, all has stretched? Okay, how much? Well the Shimano M089's were £65. These were £44.99 and as I wrote, I was happy to save some money. Like lots of products from B'Twin they come with a two year guarantee, so I will be keeping the receipt just in case. I have very happy with these so far and pretty sure that they will serve me well for some time to come. I have posted a link directly to this product on the Decathlon website should you be interested in them.